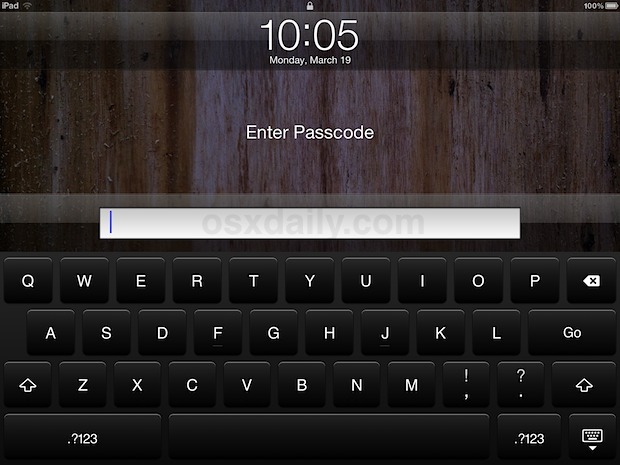 The default passcode for iPad and iPhone uses a fairly simple four digit numerical password, these are certainly better to use than nothing, but they can be somewhat easy to guess because statistically many people use common passwords or some variation of a simple theme, like a repetition, countdown, or birth year. An easy way to add more security to an iOS device is to disable simple passcodes and utilize the full keyboard, allowing you to type out complete passwords of varying complexity, instead of the simple numerical passcodes that are initially used. You can now use a combination of letters, numbers, and special characters, though using the latter can be difficult to remember since their placement is different on the iOS keyboard than a standard QWERTY layout. Don’t set something so complicated that you can’t remember it yourself, though it isn’t too difficult to reset if you need to, assuming you have access to a computer. For those especially concerned with security, you can also set the iPhone or iPad to “self destruct” and automatically erase all data after 10 failed password attempts. This is also a fairly good anti-theft countermeasure, just make sure you don’t forget it yourself or you could accidentally wipe your device. Remember, even if you do not use the strong passcode option, at least use the default level of pass code protection with numbers, this insures some level of security and privacy as users will need to enter the proper code before being able to get beyond the lock screen. Other than being safer I actually think it’s easier to type a passcode in with the full keyboard than the tiny number pad in the center of the screen. If you use the regular 4 digit passcode, it can be figured out in around 40 minutes, it’s a really good idea to use a larger code. You can punch in 10,000 number combinations in 40 minutes? You must also have great nunchuck and bowhunting skills! If the iPhone “self-destructs,” can you then restore it from your backup? Yes. If you wipe it remotely though, it has to be unlocked with the help of an authorized computer and iTunes, which is typically by its rightful owner. meeehh… doesn’t work on the old stinkin’ 3G ….